The global LTE equipment market demonstrates intense competition owing to the presence of numerous service providers, states a report by Transparency Market Research (TMR). Some of the predominant players of the global LTE equipment market are Ericsson AB, Fujitsu Limited, Huawei Technologies, Motorola, Nokia Corporation, and so forth. The players of the global LTE equipment market are adopting innovative approaches to stay ahead. Wherein, established players are focusing to increasing their network coverage to improve their market penetration and strengthening their standing in the global market. As per the recent published report on the global LTE equipment market by TMR, the market is expected to reach a value of US$104.49 bn by 2025. During the forecast period from 2017 to 2025, the global LTE equipment market is predicted to expand at a CAGR of 21.4%. Geographically, the global LTE equipment market is segmented into Asia Pacific, Europe, North America, South America, and the Middle East and Africa. Among all the six regions, Asia Pacific is predicted to led the regional marker share owing to the high revenue contribution. 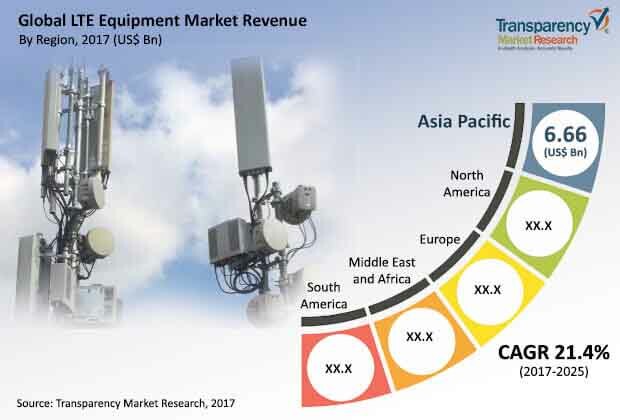 As per the report, Asia Pacific LTE equipment market is likely to expand at a massive 23.5% CAGR over the forecast period due to the presence of many key players in the region. In terms of application, the market has been classified into commercial and government. Wherein, commercial sector is the highest revenue contributor to the global market as per the report published by the Transparency Market Report. The massive adoption of internet-enabled devices by the global population has spelt opportunities for the global LTE equipment market. The convenience of living offered by the smartphones, and tablets is the one reason behind its sudden and massive adoption. In addition to this, the growing demand of the consumers for high speed data service is compelling telecom operators to provide efficient services. Downfall in prices of internet-enabled devices has increased the sales of smartphones significantly. Further, decreased prices of smartphones has contributed a lot in increasing the global demand for LTE equipment. Demand for low cost data service and end to end network service are the primary drivers of the global LTE equipment market. The increasing demand of high speed data service is compelling telecom operators to invest heavily in research and development of advanced equipment. Both private and public operators are investing in 4G and 5G networks which are responsible for the growth of global LTE equipment market. Key players of the market such as Bharti Airtel, Vodafone and Ericson AB are making huge investments to uplift the market prospects. Additionally, they are focusing to replacing their traditional business approach with new cost controlled and quality efficient technique. Further the rising demand for high-speed internet and increased availability of internet-enabled devices at lower prices in emerging economies is fueling the market too.